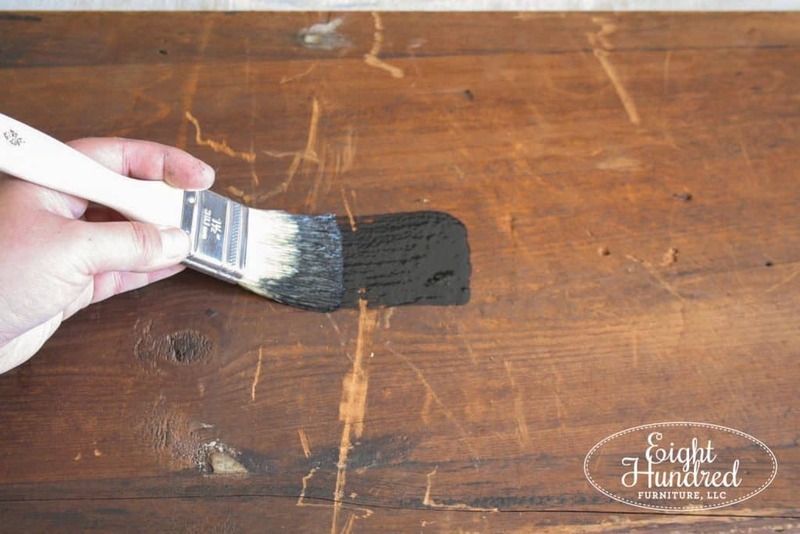 Chalkboards are the perfect project to try if you are brand new to Miss Mustard Seed’s Milk Paint. 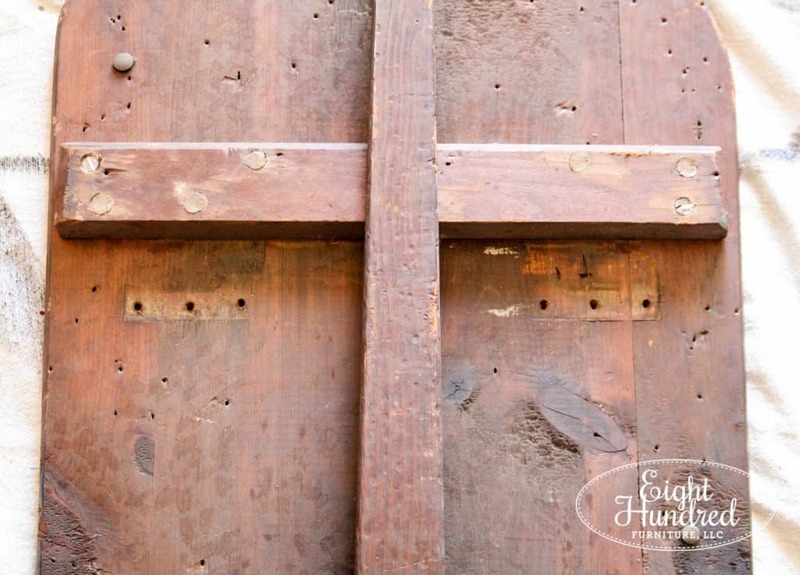 They’re easy to make, can be made out of any wood substance and they’re super versatile to have in your home! 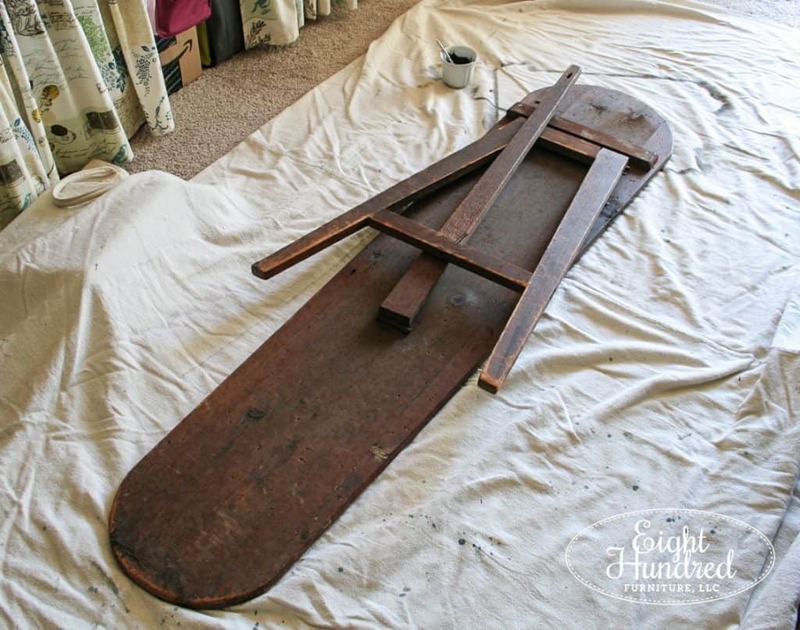 My chalkboard specimen was this antique wooden ironing board. 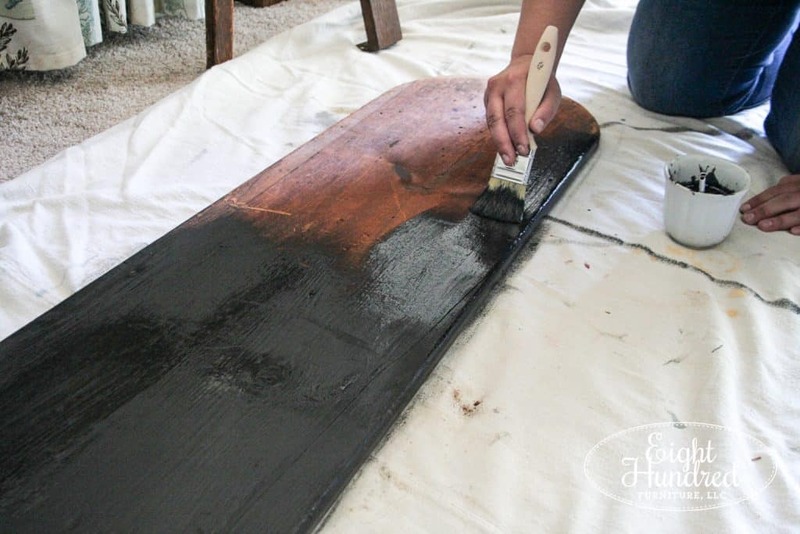 I purchased it from the owner of Morgantown Market for a fabulous price and couldn’t wait to transform it into a chalkboard sign. I had to do some structural reworking because the legs were all wonky. It was missing a few parts so it didn’t sit upright properly, as you can see. Downward facing dog was about all it could do (much like the sun bathing cat in the background). 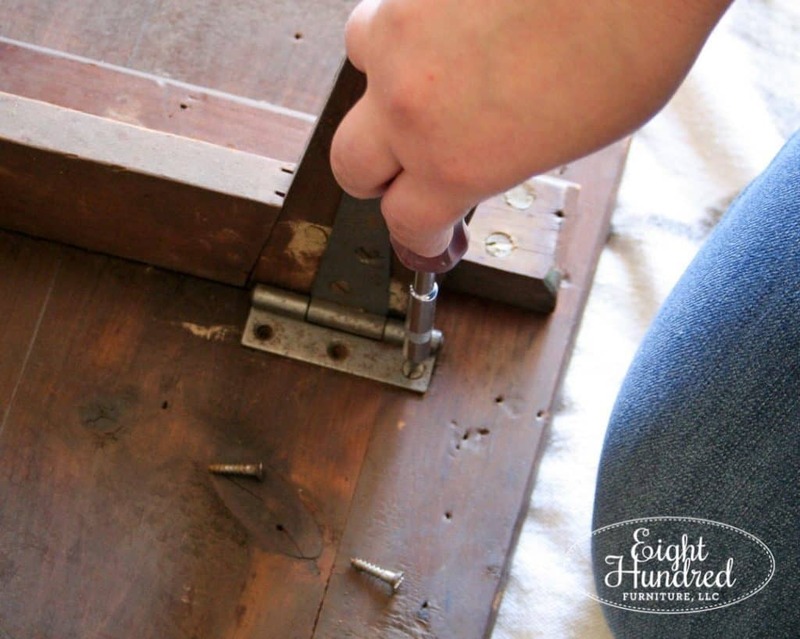 I used my flathead screwdriver to completely remove the legs along with their hinges. I needed to use a tiny head attachment because the screws didn’t have a very deep channel. Getting adequate torque was a bit challenging, but they all came off eventually. Now that the legs were off, I could flip the top over and begin painting it. I actually saved the legs that are in the top right corner of the photo below and reattached them so the sign propped up like an easel. I chose Typewriter for my chalkboard because I wanted a traditional black background. This was going to go in my booth at Morgantown Market by my MMS Milk Paint display, and I wanted it to pop. My plan was to write upcoming demonstrations and workshops on it so shoppers can take part in the fun! 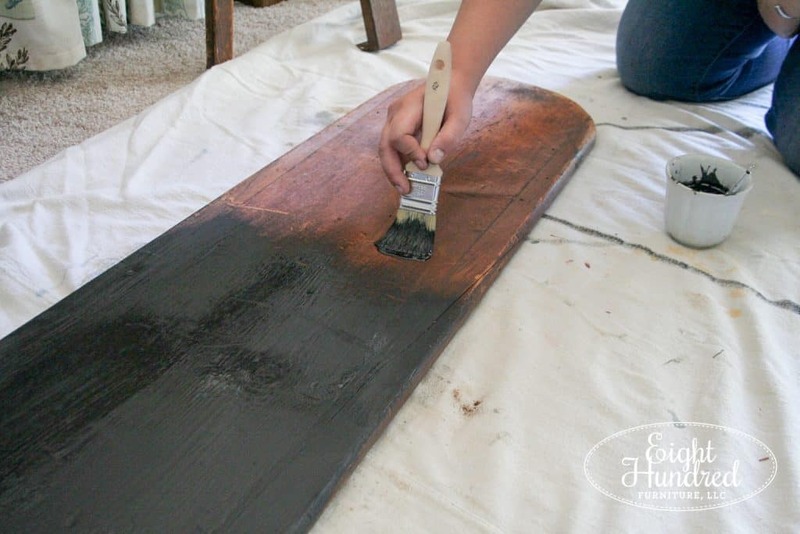 You could also use a mixture of Boxwood and Artissimo to make a vintage green chalkboard. The formula is 3 parts Boxwood with 2 parts Artissimo. I mixed up about 3/4 cup of Typewriter powder with the same amount of water in an ironstone cup. 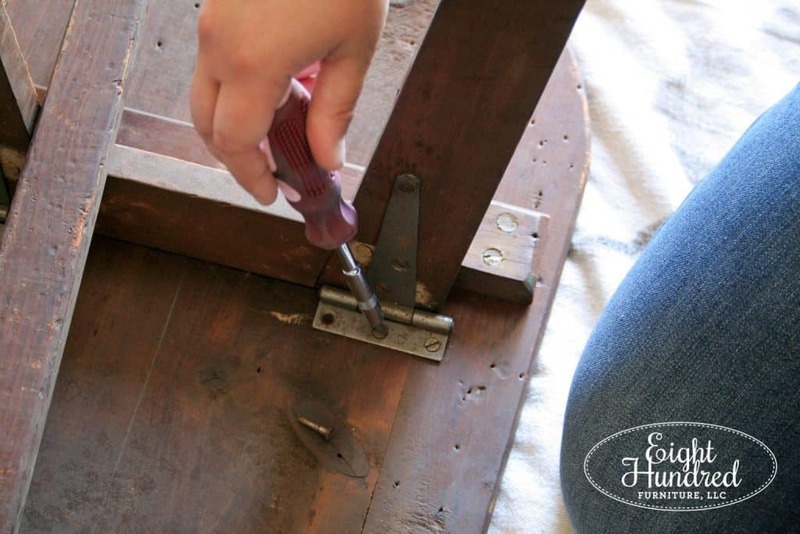 Because I was painting it on raw wood, I knew it would be thirsty and soak up a lot of Milk Paint. 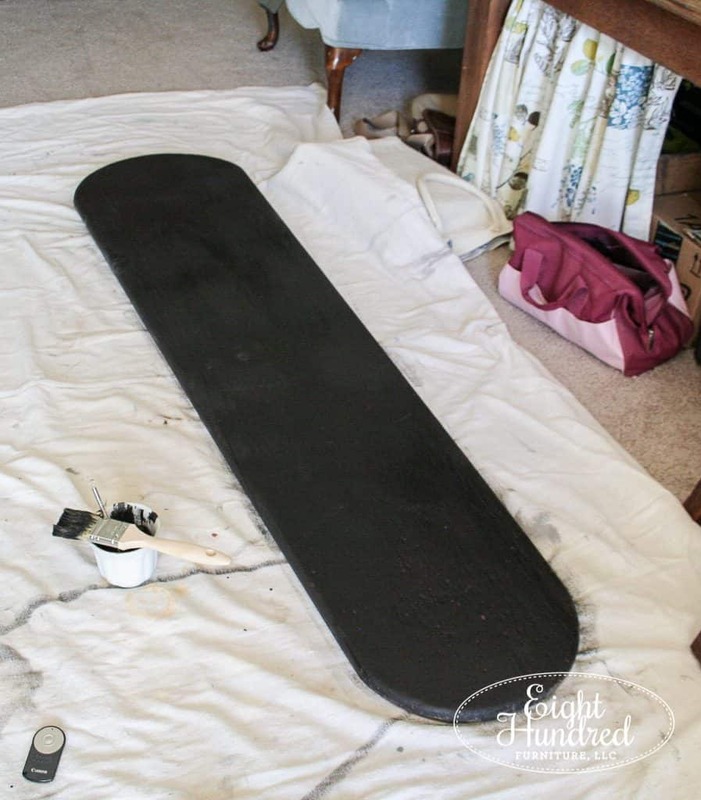 I painted two coats of Typewriter on the front and along the sides of the ironing board. Typewriter has excellent coverage and soon, all of those scratches, nicks, and dings were gone! As I thought, the wood was very thirsty so the 3/4 cup of Milk Paint was just enough. It didn’t take very long to dry either! 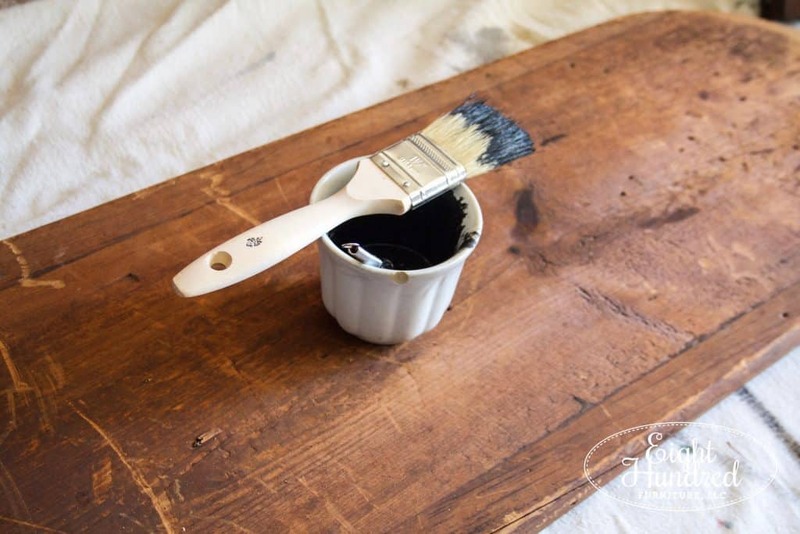 Milk Paint soaks in more like a stain rather than laying on the surface like modern paints such as latex or chalk-type paint. 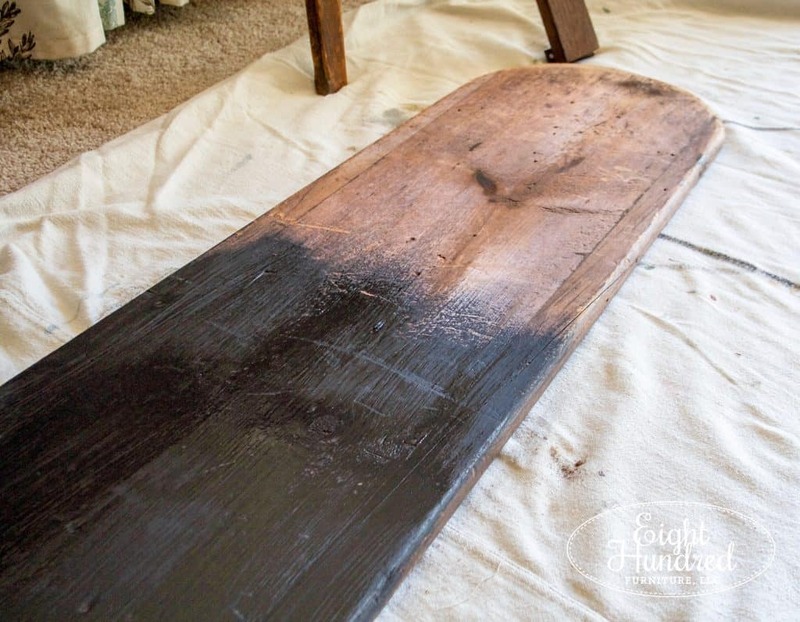 It dries pretty fast on raw wood. Each coat took about 20 minutes to dry. 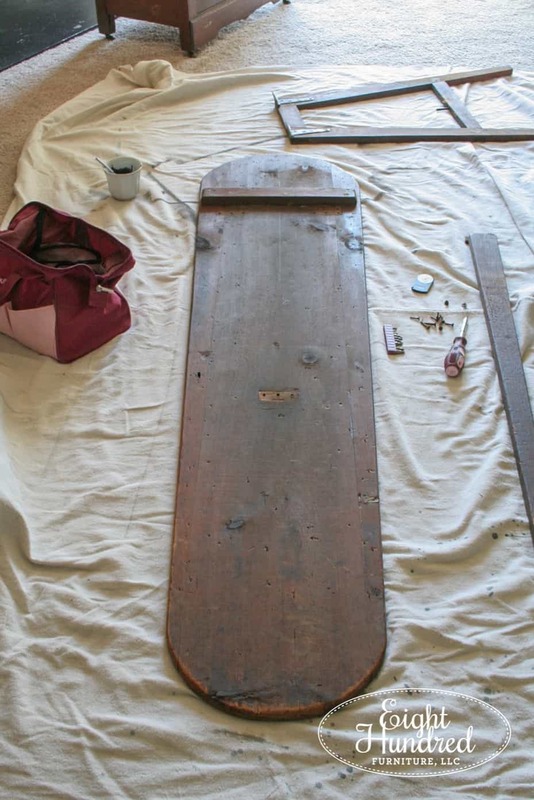 After the board was dry, I went over it with 400 grit sandpaper to smooth away some of sediment that didn’t brush out. I did get some white specks from the dried pigments, but I was going to season the board with chalk anyway so it didn’t matter. 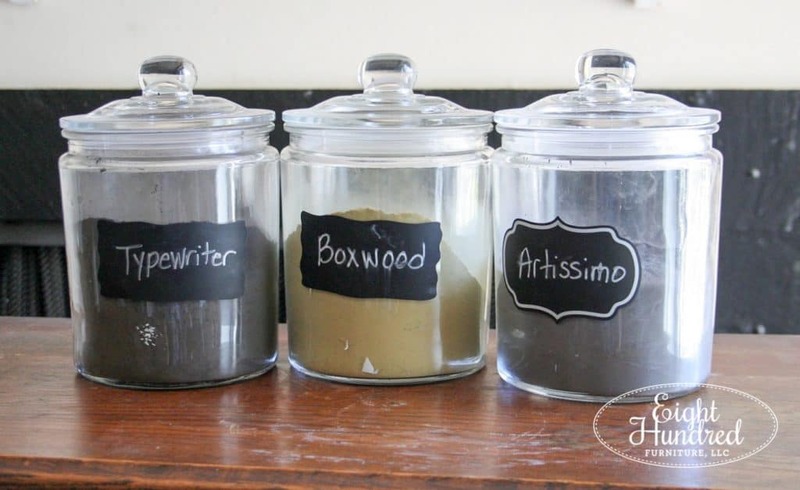 “Seasoning” a chalkboard is essential to prevent your words from being burned onto the surface. This is also called “ghosting”. 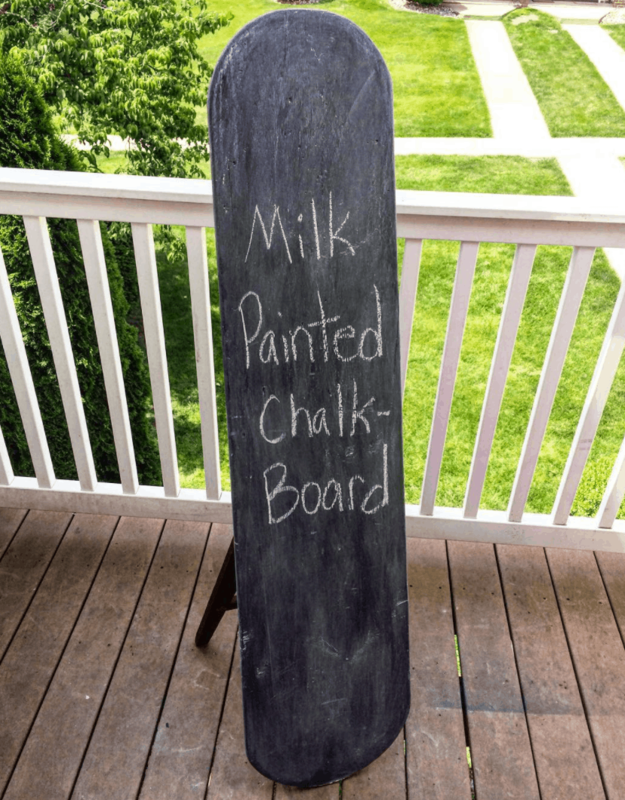 Basically, you take a piece of chalk, turn it sideways, and rub it all over your new chalkboard. Here’s a photo of Miss Mustard Seed seasoning one of her chalkboards. 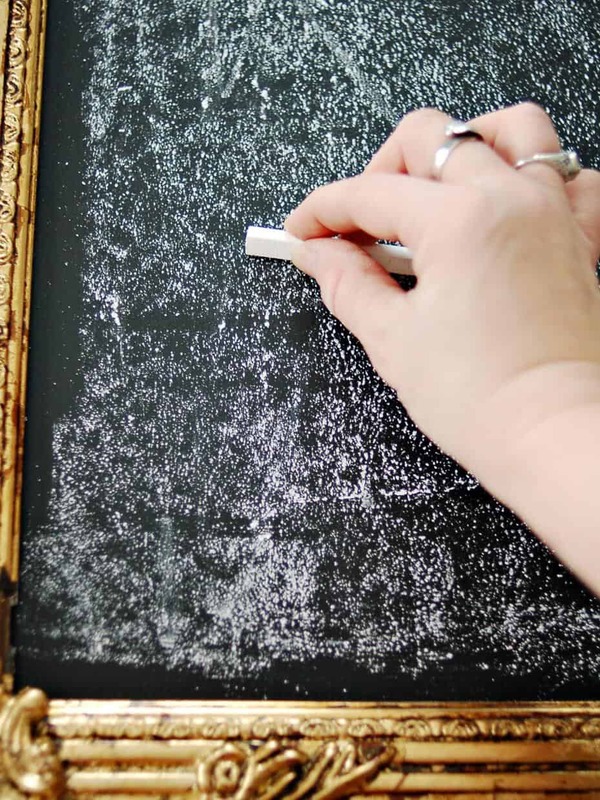 After seasoning the chalkboard, I wiped it back with a paper towel. 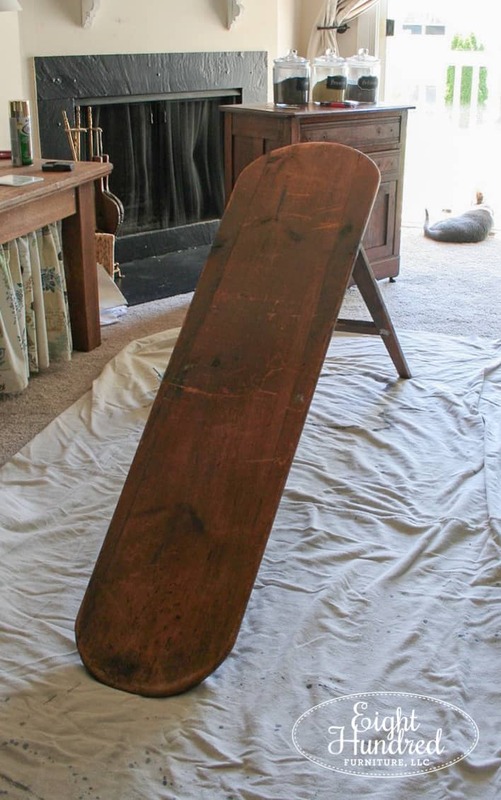 My last step was to rework the legs so the ironing board stood up more like an easel or a sign. And voila! Milk Painted chalkboard sign complete! If you would like to a list of the materials I used for this makeover, you can find them below. 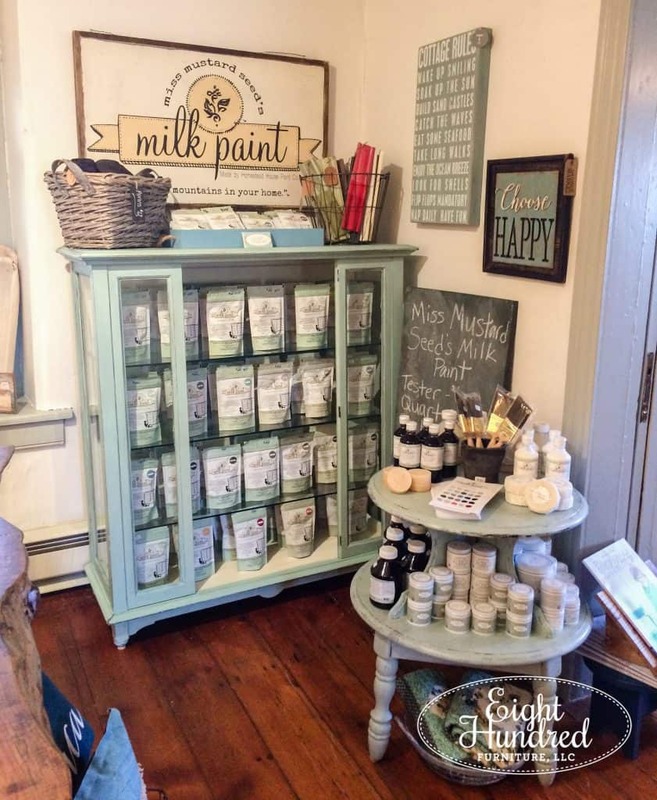 Shop for Miss Mustard Seeds Milk Paint in my booth downstairs atMorgantown Market and at Painted Table Designs!